Is one of the best ornamental annual grass. Putting annual grass into a container is not a new idea and we here at Vale’s Greenhouse have many different kinds from Toffee Twist, that is a rich brown colour, to Pheasant Grass that turns a beautiful pink colour in the late summer. Frosty Curl’s is a stunning green colour that that will tuck nicely into the front of your planting, and curve gracefully over the edge of a sunny container. Try mixing them into your container, and be amazed to see that will hold its form when the traditional growing season comes to an end. You will be the talk of the neighbourhood, when your containers look great in December. May be the oldest plant that you will remember from your childhood. Who can resist the sweet smell but take a look again. New colours!! Copper, Wine Red, Apricot, Red and Salmon are the newest of the colours. 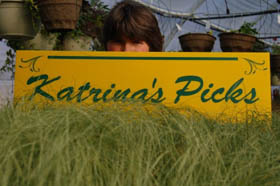 While traveling in Ohio in 2007 Vale’s Greenhouse staff had the opportunity to be introduced to these new colours. And we are very happy to bring them to you in Canada. With 6 plants per pack, these fashionable and unique colours break the rules when you think of Alyssum. This plant was once known as a neat little edging plant, but now has increased status to a fully qualified bedding plant, being used by the most sophisticated gardeners. Is a very showy, quick-growing and beautiful plant to grow. Gleaming purple red colour blooms are contrasted against greyish-green leaves. This plant blooms all summer and well into the frosty fall. Arctotis is a large group of plants that come in many different colours that have arrive to us from South Africa. A real eye grabber this plant is easy to grow and well suited to be planted in containers. Large flowers follow the course of the sun through the sky, bending towards the east during the night to wait until the dawn. Even though this is not a new plant it is one of the most loved basket plants that we have. Small-variegated leaves of green and yellow are clad generously on gracefully arching stems. This shade tolerant plant is perfect mixed in with fuchsia, begonias and ivy. (However the less sun this plant receives in the container the less the variegation will show.) This plant will also thrive in the sunny container and can be mixed in with Geraniums, petunias, and other sun loving plants. The leaves become quite yellow toned (Thus the Lemon part of the name not the scent) in a sunny location and put on the wonderful show all summer, continuing well after the fall and the cool nights have begun. Bring inside for the winter, as it can be an easy houseplant. We all know that Katrina hates geraniums then why is this one on her list? Well does this look a geranium? Vivid two-tone yellow, heart shaped leaves, with stunning orange red flowers that bloom all summer long. Perfect for the container or the garden to give that touch of the exotic, but it is still just a geranium. If this plant is in too much shade the yellow, will turn lime green, (not that bad of a thing to have happen.) But in general this plant is happiest in a warm sunny spot. Try mixing this with Arctotis Pumpkin Pie. Why is this plant, that is so common and used over and over again in the shady container, hanging basket and window box on the “Katrina Picks” list? Well, in her own words “I have grown to like, use it and think that is great” That is not how it started out, “I shunned it to the back of the greenhouse.” But as the years have passed and many more varieties of Bacopa emerged on the market “Giant Snowflake” is the one to use. Large white flowers adorn this trailing bush plant. “I am sure it is a weed, somewhere else in the world like South Africa” but here in zone 2, in Southern Alberta this happy plant blooms all summer needs no dead heading, fills out beautifully in a mixed part sun to shade basket.